Stuff and Clutter: It’s EVERYWHERE! Pile filing. Everyone does it. That stack of paper that starts out small and over time grows into this massive thing that just won’t go away. No matter how much you try, it just keeps growing. And of course next to it is a glorious mess of pens, calculators, cords, and whatever office supply item you can think of. It’s not just you either; it’s everyone in the office. Clutter is everywhere, and let’s be honest, it drives you crazy. How can you store all this stuff and get rid of clutter? 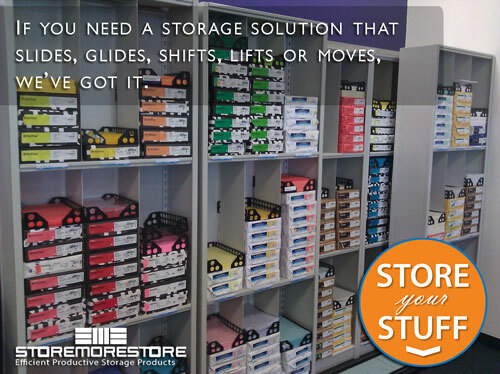 StoreMoreStore has the answer – sliding shelving. What’s So Great About Sliding Shelving? Why is sliding shelving better than the pile filing system or even a lateral cabinet system? Well for one, you can store both files and other office supplies like pens, paper clips, computer cords, paper, and so much more – all in one place. And that place is off your desk and out of sight. Another reason to use sliding shelving is the massive amount of space that you can save. Instead of having a row of shelving, an aisle, and then another row of shelving, you have back to back rows of shelving. Without that aisle in the middle, you can store more stuff in less floor space. Accessing that back row is simple because the front row slides on tracks to move out-of-the-way. If you are wondering how to organize all your stuff in sliding shelving, it’s easy too. Use the back row for things that almost never get used but that you have to keep around the office. Then, use the front row for stuff you access and need every day. Think about all the time and energy you will save with sliding shelving. No more digging through the piles and coming up empty-handed. No more stacking old boxes of stuff on top of the lateral file cabinets. The clutter will just disappear. And if you really want to never see the stuff again, add a door. Not only will it hide everything in the shelves, it will add that extra layer of security without an ugly “keep out” sign. Ready to Get Some Sliding Shelving for Your Office? Now where can you get this awesome sliding shelving we’ve told you so much about? From us at StoreMoreStore! (Did you really think we would tell you all these great things and then leave you hanging?) We have tons of sliding shelving systems you can shop for online. So what are you waiting for? Go shop!